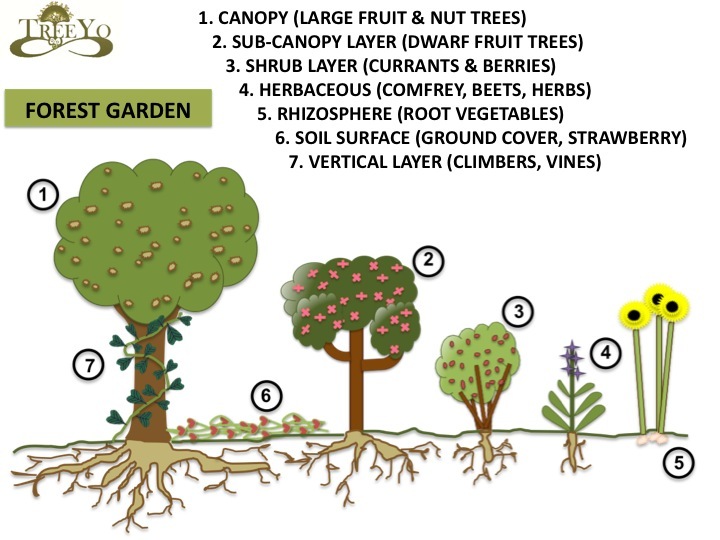 The story of how Permaculture originated is not 100% clear but from my understanding it goes like this. In an age of extreme environmental damage in Australia, the outrage led to outreach for Nature much as Rachel Carson was doing in the states at the same time. 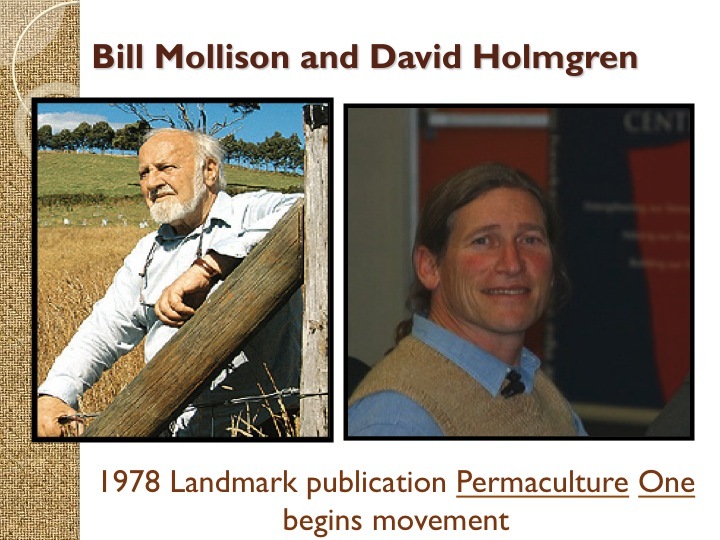 Bill Mollison was a University Professor and one of his graduate students was David Holmgren. From this relationship, they launched the idea through David Holmgren’s thesis paper. In 1978 they collaborated on the publication known as Permaculture One. From there the movement was born and the two paths began to diverge relatively early on. impact local foods and communities is astounding. This has allowed the movement to grow organically and to evolve without static underpinnings that only serve a guru. Bill Mollison, frankly, was a brilliant marketer and the PDC itself is what has allowed so many to interface with this liberating knowledge. 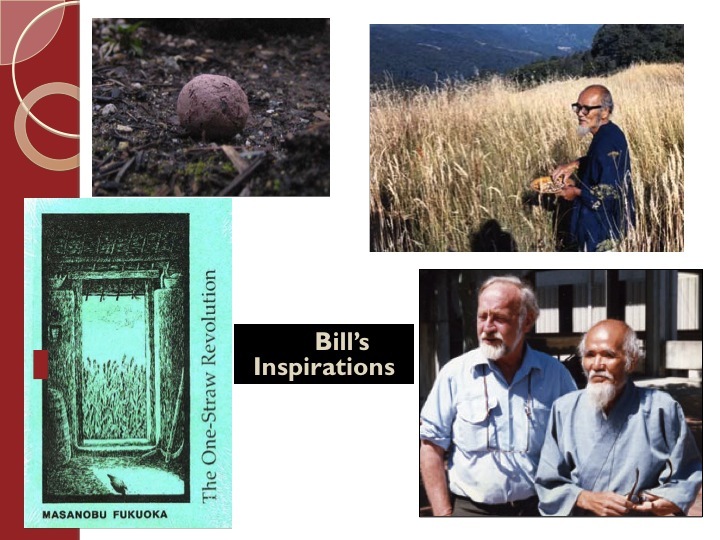 Thus I teach more from the philosophy of Bill Mollison and will below look at some of his major influencers to construct this approach to land use and development known as Permaculture. produce grain and build soil. Typically soils are washed away in the process of grain production and even our best no-till methods of modern day still wash away at the very minimal 1 mm of soil. Multiple that over 1000 years, the average length of a civilization, and you have a meter soil loss and the subsequent collapse of the culture. Mr. Fukuoka was able to reverse this trend and grow a food forest with little inputs and high yields. He was always searching for ways not to do rather than constantly adding to our lengthy list that accompanies our western farming ways. This system took many years to build and was only possible from many years of trial and error and good observation. He also pioneered the now popular technique called seed balls. 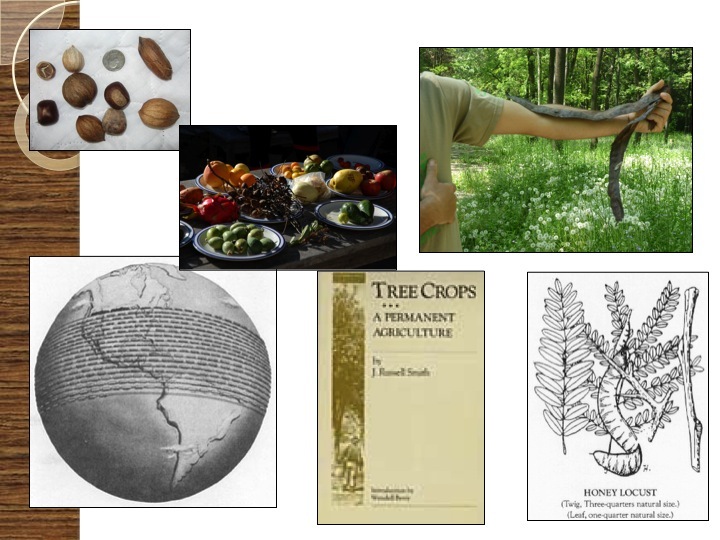 His main influence in my opinion was allowing Mollisons to see pattern of time and space as it related to how we manage Permaculture systems including the use of biological resources. Another obvious mentor for Mollison was J. Russell Smith who wrote a book called Tree Crops: A Permanent Agriculture. Mr. Smith was very outspoken about what grain agriculture and destructive grazing practices were doing to the vast natural capitol of North America. The deep, rich soil was being washed away at a ridiculous rate and the Dust Bowl was a scene that formed his philosophy on how agriculture should be approached. Thus he wrote about bringing the Savannah back essentially through the reintergration of Tree Crops. One species he recommended using was the very African-Acacia like tree known as the Honey Locust (Gleditisia tricanthos). These large pods can be fodder for cows and the growing of grain to feed cows would be lessened, while the pasture environment stabilized by the interspersed trees. I believe Mr. Smith really allowed Mollison to see the pattern of stacking and influenced Bill’s title of his tree chapter, Trees and their Energy Transactions. 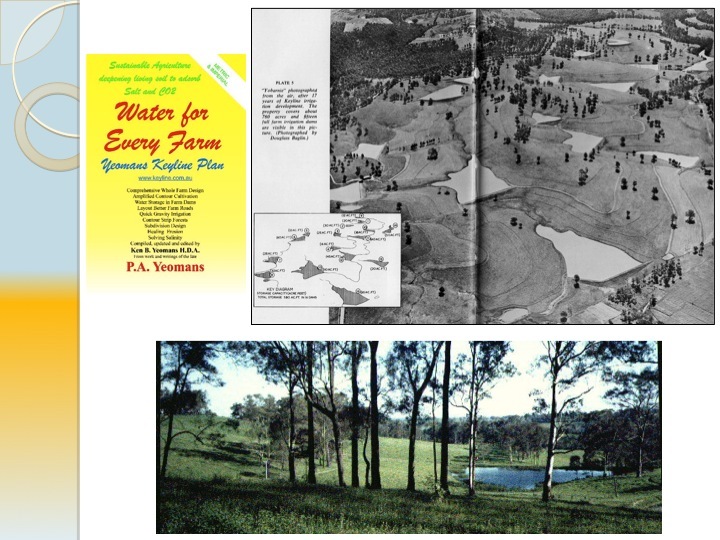 The design process that Mollison unfolds discretely in his book is obviously influenced by another Australian named P.A. Yeoman’s and his Keyline Scale of Permanence. Yeoman’s was an Australian miner in the mineral rich country who entered into agriculture sector originally as a tax shelter like so many others in the day. He put his brother-in-law in charge of the farm and in its first year the drought ridden farm burned. Australia has a long history of burning and this fire cost his brother-in-laws life. This gave Yeoman’s the impetus to drought proof his own farms and go beyond and try to reform the Australian/ American big ag. chemical system that was rapidly forming. Thus he developed a system of farm layout that allowed for energy to be cycled quite abundantly in the form of ponds and dispersing channels. This allowed him to store water and flush the landscape with the life giving energy known as water once a month in alignment with the moon. Subsequently, he was able to build top soil at record lengths when this planning procedure and water harvesting technique was combined. For the distribution of water on a broad acre scale, he used a modified chisel plough, or sub soil ripper, to create channels that drew water from the valleys back out to the ridges. This process was rehydrating and gave microbes the ability to continue the nutrient cycling that is defining of rich pastures. To explore this topic furhter, please read a blog I wrote after taking a course from the Keyline instructor Darren Doherty. Lastly Bill Mollison was influenced by many cultures of ancient wisdom and indigenous knowledge. This is not restricted to merely the peoples of North America and Australia but also Celtic influence from European ancestry. This influenced quite heavily his revolutionary chapter, A Pattern Understanding, from the Designers Manual. Pattern based thinking was common in the ancients, using dance and song to disperse information, rather than just writing. Now we rely too heavily on the material based thinking and need to swing to a better balance. Furthermore, one of the most important features of culture is food. 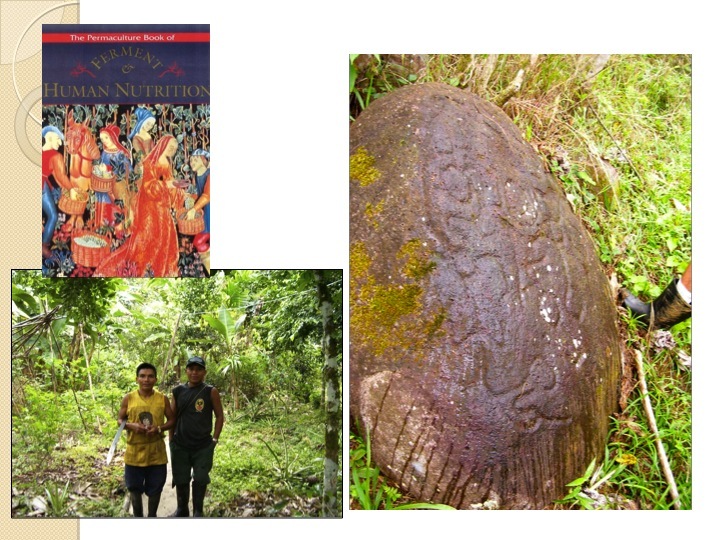 According to Scott Pittman of permaculture.org, Bill considers his most important book the book below called Ferment and Human Nutrition. This was a documentation of Bill’s studies and travels around the world looking at how food was traditionally preserved and nutrients unlocked. Finally, this is why we include a lesson and hands-on surrounding fermentation in our PDC’s as we see it as such an important link between food and culture. Bill has a lengthy reference list after all of his chapters which might mean that the presented material above is also some of my main influencers of understanding permaculture. Regardless, these are good entry point readings and topics to delve into further. All make a great case for a reformation of culture. Lastly, another one of my main influencers in understanding patterns, ecology, and eastern philosophy was Aldo Leopold who is considered by many “The Father of Game Management”. Please read his great article that defines this pattern based thinking in my opinion: Thinking like a Mountain.